Since 08/29/2013, diligent and creative kids meet and tinker stories and pictures. Something “You silly adults can’t even imagine” is about to develop. Just to be clear! “Fantasieland”- a book illustration project for children with and without immigration background in co-operation with literature workshop “Bücherwurm”/ZMO-Jugend e.V., supported by Kultur Aktiv! Since January 2011, Susanne Schrader, graduate theater painter and theater play leader led the literatzure workshop “Bücherwurm” at ZMO –Jugend e.V. Dresden. In this time, many imaginative stories, fairytales, poems, comics and haikus were made. They are still lying around in folders and piling up in baskets, so hardly anyone can see and read those precious stories. Together with the artist Elena Pagel, we have developed an idea that is both creative and practical: taking fairytales, fantasy stories and poems out of the fairytale book box, designing them, illustrate them with pictures, setting titles and initials and print them manually. Finally: small booklets are compiled on DVD and we want to print and publish some anthologies! Each “Buchwurm”-child gets a DVD and booklets with own fantasy stories! In professional supervision, children are led with caution to work freely and single-handed. 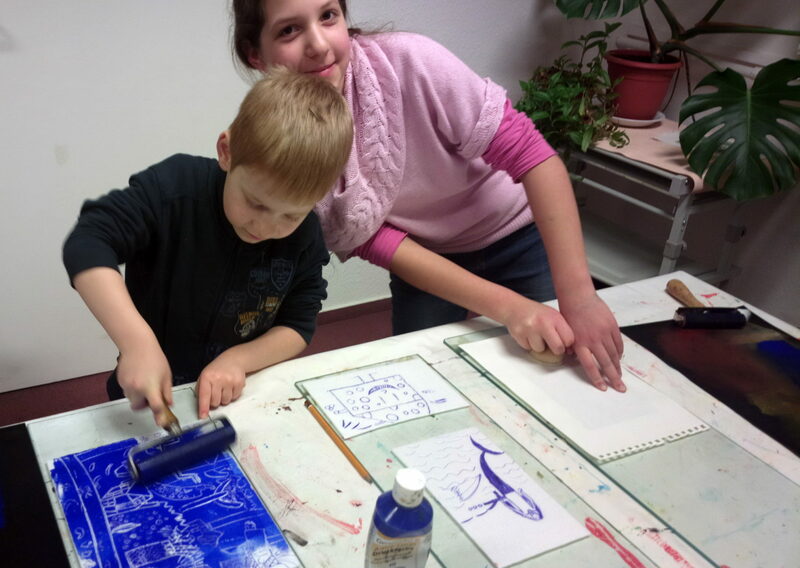 They learn experimental painting and manual printing techniques on paper, the basics of composition (up to creation of plungers), illustrating pictures and initials and accenting titles. Start: from august 29th, always on Thursdays! New participants are always welcome! Freie Akademie Kunst + Bau e.V. ZMO – Jugend e.V. + Kultur Aktiv e.V.